The only hill station of Rajasthan, its cool atmosphere and lush green surroundings make it a major tourist spot within the state. The most important attraction, however, are undoubtedly the Dilwara temples, which is one of the most stunning piece of architecture in the country. If you are a history or architecture buff, this is one of the places you should absolutely not miss out in India. The exceptionally intricate architecture of the Dilwara temples are of course the main attraction here, and you can easily spend hours wondering how these temples were built over 2 centuries, almost a 1000 years back. The temples were specifically made so that they are plain from the outside to avoid attraction of plunderers, and have withstood the test of time extremely well. If architecture is not your thing, then there are various lakes and viewpoints such as the Honeymoon Point, Sunset Point, etc. Tourists enjoy calm and relaxed boating in the Nakki lake, and a view of the sunset from the Sunset point. The highest peak of the Aravali Range also lies in Mt. Abu, surrounded by dense green forests. Mt Abu will offer you all you can demand from a popular and typical destination of a romantic and simpler nature. Located amidst the lush green Aravalli hills, the Dilwara Temple is the most beautiful pilgrimage site for the Jains. Built by Vastupal Tejpal between 11th and 13th century, this temple is renowned for the opulent use of marble and intricate carvings on every hook and corner. From the outside, it looks quite austere but, once you enter the inside, you will go head over heels with the stunning designs and patterns carved on roofs, walls, archways and pillars. The Dilwara Temple includes five equally beguiling temples namely- Vimal Vasahi, Luna Vasahi, Pittalhar, Parshavanatha and Mahavir Swami Temple dedicated to Lord Adinath, Lord Rishabhdeo, Lord Neminath, Lord Mahavir Swami and Lord Parshvanath respectively. Each of these shrines has Rang Mandap, a central hall, Garbhagraha, the innermost sanctum where Lord resides and Navchowki, a group of nine heavily decorated ceilings. Some other spell bounding structures include Kirthi Stumbh and Hathishala. With its simplicity and austerity, the temple tells you about Jain values and principles. Not just a place of worship, Dilwara Temple is a perfect exemplar of architectural marvel. Its beauty surely creates a magical spell that will attract you here again and again! Situated in the Aravalli ranges in Mount Abu, Nakki Lake, locally known as the Nakki Jheel is a paradise for nature lovers. Flanked by amazing natural wonders, this lake is truly a gem of Mount Abu. It is the first man-made lake in India with a depth of around 11,000 metres and a width of a quarter of a mile. Located in the centre of the hill station, the fascinating lake is surrounded by lush greenery, mountains and strangely shaped rocks. As you sail through the serene waters of Nakki Lake, it is exciting to see the life of Mount Abu unfolding in front of you. The blowing winds and the soothing temperature of Mount Abu will add to the pleasure of boating and is sure to win your heart. In the Nakki Lake which is associated with many legends, Mahatma Gandhi's ashes were immersed on 12 February 1948 and Gandhi Ghat was constructed nearby. It is a perfect destination for nature lovers and photography fiends. On the other hand, the attraction is also considered as the love lake of Mount Abu since the clean blue waters with verdant surroundings give a romantic feel. It is also said to be the sacred lake for the proud Garacia Tribe. The nearby natural wonders that are visible from the lake increases its charm. There is the famous Toad Rock on a hill. It looks like a toad about to jump in the lake. By the side of the lake, there is a path leading to Sunset Point. 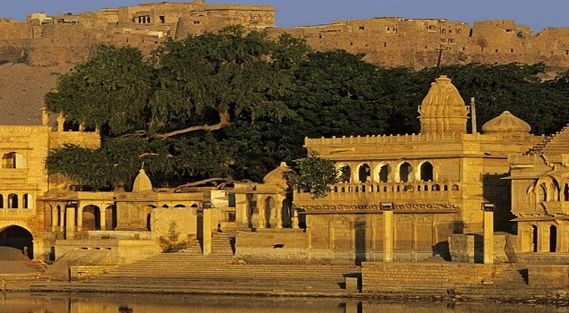 Raghunath Temple and Maharaja Jaipur Palace are also located on the hills near the Lake. Finally, a trip to the lake is incomplete without the peaceful boat ride. A perfect getaway to nature's lap, the Nakki Lake will add some memorable moments to cherish all through. The breathtaking Mount Abu Wildlife Sanctuary boasts of rich biodiversity which adds it to the list of must-visit places in the tiny hamlet. The sanctuary is one of the oldest parts of the Mount Abu mountain ranges and is the origin of numerous sightseeing points with exquisite views. It was given the status of a wildlife sanctuary in 1960 to preserve flora and fauna of the entire region and is, therefore, an important eco-tourism spot. The sanctuary is a floral beauty with a vibrant vegetative cover of evergreen forests. It is the perfect place if you wish to witness the best of wildlife in Rajasthan in their natural habitat combined with a thrilling experience. Spread across a distance of 288 km, the sanctuary crosses numerous mountain highs from 300 m to 1722 m at Gurashikhar which is considered to be the highest peak in the Aravali ranges. Some features of the wildlife sanctuary include igneous rocks with large cavities resulting from the weathering effects of water and wind. The nature lovers and animal lovers will find this place soothing to their sense. Also, the scenic views of the Mount Abu Wildlife Sanctuary and the serenity that it offers from the fast life of the city are worth it. A trip to this site is going to turn out to be a great experience for all the travellers out there. If you want to escape the fast and busy life of the city, Guru Shikhar is the place to be. Guru Shikhar is the highest peak of the Aravalli Range and lies about 15 kilometres from Mount Abu. The height of the peak is 1722 meters from sea level thereby promising a breathtaking view of the Aravalli range and the hill station of Mount Abu. The peak also resides the Mt. Abu Observatory and a cave temple of Guru Dattatreya which worships Lord Vishnu. The Observatory has a 1.2 m infrared telescope. The observatory is situated here due to favourable cloud conditions. After a 15 kilometre drive, you would need to climb a few steps to get to the peak. When visited during October and November, the weather gets more cloudy and misty. Walking through Guru Shikhar at such a time would feel like walking through clouds as the mist is all around you. The road that leads to Guru Shikhar has numerous shops and stalls that serve hot tea and food. The food is priced reasonably and tastes rather delicious. Package food like snacks, chips and water bottles are also available throughout the road. At the top of the peak is an age-old bell with the words '1411 AD' inscribed on it. Ringing that bell after hiking all the way to the peak is like announcing your achievement to the valley of Mount Abu. The sound of the bell chimes long and far. Achalgarh village is a picturesque village in Mount Abu which is famous for the Achalgarh fort and Achleshwar temple. The fortress Achalgarh is situated at the top of a mountain peak. A 10 minute climb from Achalgarh brings you to the beautiful and historic Jain Temples which are famous for scenic location and beautiful sculpture. The Achleshwar temple is famous for containing a Nandi which is said to be made of 5 metals, fold, silver, copper, brass and zinc. 5km from the town, Trevors Tank is a perfect spot for nature lovers. It was actually designed by an engineer named Trevor who used it to breed crocs. It is now a popular picnic spot for both locals and tourists. The view is spectacular and the place gives you an insight into nature's bounty. Trevors Tank is a birdwatchers' paradise! Known as The mascot of Mount Abu, Toad Rock is one of the most frequented point in the itinerary of all visitors. To see the panoramic beauty of the surrounding lake and greenish hilly regions you can climb up the rock and capture the breathtaking scenery. Arbuda Devi Temple is considered the most sacred pilgrim point and stands as a testimony to the rich architectural heritage of Rajasthan. Legend has it that 'Adhar' of the goddess fell and it was found hanging in mid-air. Arbuda Devi is considered as the incarnation of Katyayani Devi. Some historians believe that Parmar rulers were originated at Mount Abu from 'Agnikund', which is why Arbuda Devi is still the Ancestral Goddess of Parmar Kshatriyas. Dhoodh Baori, a sacred well with milk coloured water near the temple is believed to have heavenly powers. The locals consider the well as a form of Kamadhenu (Holy Cow), the well is also the main source of water for the temple. The temple is constructed out of one huge solid piece of rock and the inner sanctum is reaching by crawling a narrow cave. It is one of the best specimens of rock-cut temples in India. The temple is a favourite Hindu pilgrimage spot and it is swarming with devotees during the 9 holy days of the Navratri season. You can reach the temple after a 365 step climb, each step symbolic of each day in a year which one might find to be a strenuous climb but it is rewarding as you get an entire view of the city from above the temple. The many beautiful statues and views of the mountains and forests make the climb worthwhile. Shri Raghunath Ji temple, a 650-year-old temple on the shores of Nakki Lake dedicated to the reincarnation of Lord Vishnu. Predominantly visited by Vaishnavites who consider the temple as one of the most sacred places on Earth. Shri Raghunath Ji is believed to save his followers from all the natural calamities and believed to liberate one from the pain and problems of life. The architectural heritage of Mewar can be seen through several wall inscriptions and delicate paintings and carvings can be found in the temple. The exquisitely carved idol of Shri Raghunath Ji is one of the main attractions. Legend also tells us two tales, one a tale of unrequited love of a beautiful princess who's stepmother disapproved her love affair with Mount Abu's ruling son. It is believed that she died young as she wasn't able to marry her lover and the temple was constructed in her honour. Legend also states that the temple was built by Shri Ramanand, a 14th Century well-known Hindu scholar. Brahma Kumaris World Spiritual University is an international, non-governmental spiritual organization founded by Dada Lekhraj Kripalani in the 1930s, with its headquarters located in Mount Abu. The hill of the Brahma Kumaris is also called 'Madhuban' (forest of honey). The group is a largely self-sufficient community, with a large international family of practising yogis who come here each year. The founder Dada Lekhraj Kripalani's meditation place, where he spreads subtle rays of peace to all the souls of the world, is now called the Baba's Hut. Om Shanti Bhavan, known as The Universal Peace Hall, is a 3,000 seater auditorium where various conferences take place all around the year. Raja Yoga is the form of meditation taught here which derives its teachings from spirit possession and mediumship.The start of each course is through the oral study of Murli (flute) which is said to be the Supreme Soul speaking through Brahma Baba. With over 8,500 centres in 100 countries, the movement has claimed to have 825,000 regular students. Universal Peace Hall, also known as the Om Shanti Bhavan, is the main assembly hall of the Brahma Kumari Spiritual University, constructed in 1983. The serene white structure has a seating capacity of 5,000 with a facility of translation in 16 languages done simultaneously during various events. The attractive hall was declared as a public tourist place after which more than 8,000 people visit on a daily basis. Spiritual conferences are organized yearly for people from across the world. The free-panning structure has also been a venue for major international conferences. While you are here, a member of the Brahma Kumaris will take you around in groups indulging in an interactive session about everyday values and resolving stress in one's lives.They also provide an insight on the Shastras and Puranas. Emphasis is laid on meditation for one's overall well being. One can see the importance of introspection on one?s values, karma and the wheel of life. This hall is also an important centre to learn Rajya Yoga meditation. While visiting, one can attend the various conferences, workshops, courses, seminars on spirituality and meditation which take place all around the year.